Emily Conbere has been a playwright in residence with Youngblood at Ensemble Studio Theater, Mabou Mines Theater, and American Lyric Theater/ Opera Company in New York. She has an MFA in Playwriting from Columbia University and is currently the resident playwright at East River Commedia in Brooklyn and commissioned to write a play about the 1927 bombing in Bath, Michigan. Emily has had opera productions at the Kansas City Art Institute, and Symphony Space and PS122 in NY. Her plays and musicals have been produced at PS122, Ensemble Studio Theater, Collective Unconscious, and as part of New York's Undergroundzero Festival; as well as at The Southern Theater (MN) and Williamstown Summer Theater. Emily's play "The Scholar" was presented at the State Theater of Bielefeld in Germany and published with S. Fischer Verlag in 2008. Emily was a finalist for the Bay Area Playwrights Festival 2008 and for the Creative Capital Grant, 2009; and a recipient of the Sloan grant, a MacDowell Colony fellowship and a Tofte Lake Artist Residency. Her one-act play, "Slapped Actress" is published in the Best American Short Plays Anthology 2008-2009 by Applause Books. 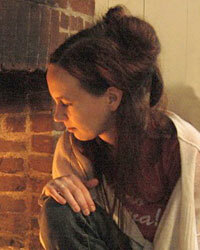 In 2011, Emily received an Artist Trust GAP Award to turn her one act, "Broken Dogs" into a full-length play. She also participated in 14/48 at ACT Theatre and, "Big Story Small," with PONY World Theater. She is currently a writer in Seattle Rep's "New Play Program".